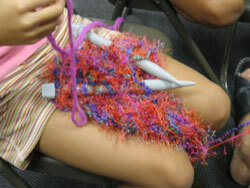 It looked like kids' day today at Knitsmiths. 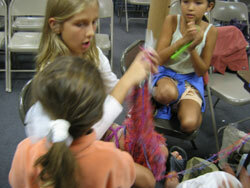 May's daughter and Nina's girls were all working on knitting projects. A lovely, fluffy boa scarf (it's on size 35 needles!). 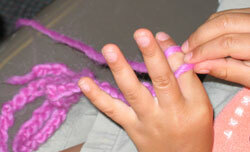 And the youngest girl was doing finger crochet. Neato! Nina's finished all the Plaid vests she was making for her children. 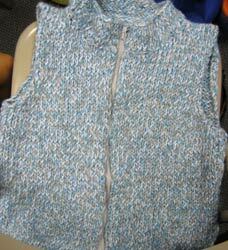 She's using the same zippered vest pattern from Jil Eaton's Big Fish, Little Fish and different colors of Rowan Plaid. The first one was in lilac and was for her daughter. This one is done in turquoise color for her son. I love these vests - what a great idea. 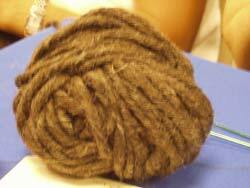 Look at this amazing ball of yarn Nina's using! She's using this super chunky wool - practically right off the sheep's back - to make a vest for herself. Nina is working on Plaid (that's Rowan Plaid) vests for all her kids. 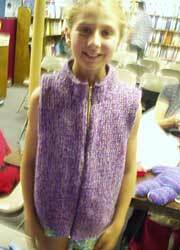 Here's her daughter in the first finished vest. You think that's sweet just look at what her daughter made. 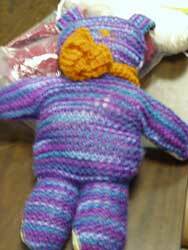 A little knitted teddy bear! Just look at that adorable little scarf. Awwww. 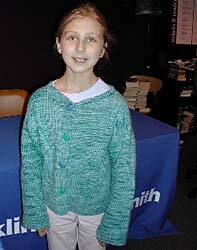 New Knitsmith! First sweater! Hooray! 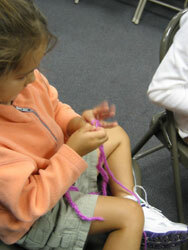 Mom, Nina, is our new knitter and her daughter is the happy recipient.